Studying the fracture toughness behavior of high strength low alloy V steels using the charpy v-notch test reveals a series of interesting results. At a range of temperatures the comparison between V+Nb and V ductile brittle transition was compared demonstrating a clear distinction in material behavior. In the work of S. Illeskas et al. the two low carbon HSLA steels, 16MnNi4 and 16Mn4, for impact fracture testing were studied. Table 1 shows the chemical composition of the base materials, which were provided as 10 mm thick rolls. 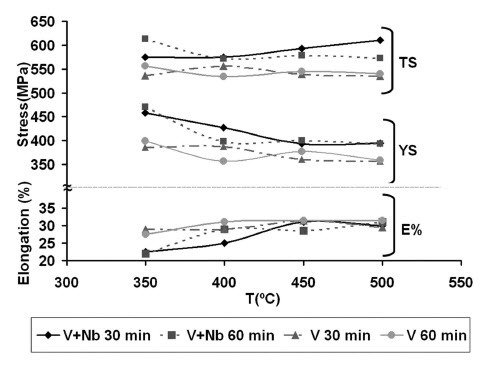 The 16MnNi4 (V+Nb) and 16Mn4 V) samples were respectively austenised at 1,050°C during 30 min and 15 min at 1,000°C. The austenite grain size obtained under these conditions was of 16 μm for the V+Nb steel and 27 μm for the V steel. After the austenisation, bainite was formed by immersing the samples in a molten salts bath (KNO3/ NaNO3, 1:1) at a temperature between 350 and 500°C and for times ranging from 30 to 60 min. Impact fracture testing was conducted to ascertain the fracture characteristics of the material. The Charpy V-notch test (CVN) technique was selected to measure the impact energy of the base and respective heat treated materials. First of all, the Charpy curves are presented for the initial materials. Figure 1 shows the ductile-brittle curve for each of the steels from which the ductile brittle temperature transition was determined. The temperature curve of the Charpy V-notch impact energy for the two materials in the as-rolled condition exhibits high values of absorbed energy in the ductile region: 225 J for the V+Nb steel and around 175 J for the V steel. Also, the V steel shows a clear ductile-brittle transition with fully brittle behaviour at and below –50°C, with an absorbed energy of around 40 J. The transition between both behaviours occurs at around –40°C. In the case of the V+Nb steel, the curve does not present the classical “S”- shape, but instead an upper and intermediate plateaus, both corresponding to high absorbed energies in the ductile region at test temperatures above –60°C. Charpy tests were also performed on the bainiticferritic acicular structures once the ductile-brittle transition was established in order to study the brittle and ductile behaviour of the materials. The V+Nb steel was tested at –60, –20 and 0°C, and the V steel at –50, –20 and –10°C. The results obtained for the different heat treatments are presented in Figure 2. A big difference was observed for the absorbed energy values at –20 and –10°C for the V steel. However, after 30 min, no considerable differences were observed when comparing different heat treatments performed at the same test temperature. Significant differences were only ascertained for longer time periods (60 min). The energy values of the V+Nb steel were lower with a decreasing test temperature. 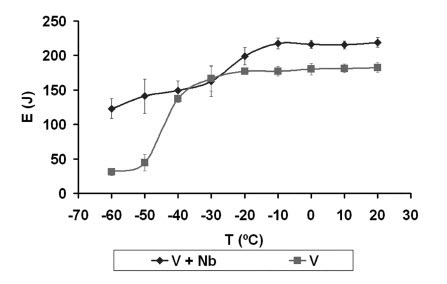 The absorbed energy decreased for the V+Nb steel for all heat treatments when compared with the as-rolled steel (for example, at 0°C the absorbed energy was 15% lower than that of the initial material). The same behavior was observed for the V steel tested at –20°C. However, the V-steel heat treated at –10°C during 30 min showed an absorbed energy increase of 24 % with respect to the as-rolled material tested at the same temperature. Generally speaking, a decrease in the absorbed energy values around 14% was observed for all the samples and for both steels with an increased heat treatment time. This is due to the growth of carbides present in the bainitic samples. An exception to this behaviour was the V steel treated at 450°C, which showed an absorbed energy independent of the heat treatment time. Comparing the results at different test temperatures, an absorbed energy decrease was observed when the test temperature increased for the V+Nb steel, the decrease being lower as with the ductile-brittle curve for the as-rolled steel. The samples obtained at 500°C showed a greater decrease in the absorbed energy values when the test temperature increased due to their high upper bainite content. However, the decrease was quite low and gradual for the samples treated at 350°C, related to a structure with a high content of a high toughness constituent such as lower bainite. An abrupt decrease in the absorbed energy was observed at –20°C for the V steel, with similar values for all the samples. Although the higher absorbed energy at –50°C, all the heat treated steels presented a worse behaviour at –20°C compared to the as-rolled materials.